AYER, Mass. The Boston Marathon bombing suspect is being held in a small cell with a steel door at a federal medical detention center about 40 miles outside the city, a federal official said Saturday. Tsarnaev was injured during a police chase Thursday in which his brother, also a suspect in the bombing, was fatally wounded. Collauti said in a telephone interview that Tsarnaev is in secure housing where authorities can monitor him. His cell has a solid steel door with an observation window and a slot for passing food and medication. 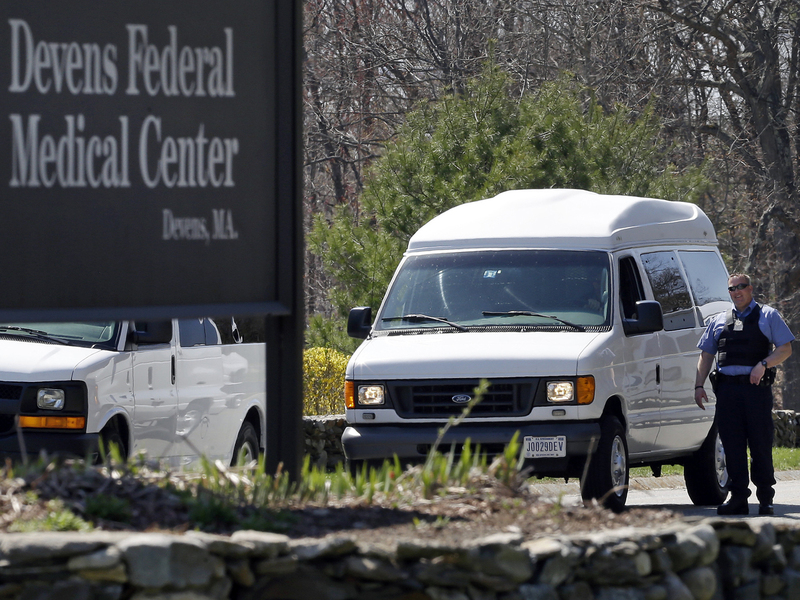 Collauti wouldn't discuss specific details related to Tsarnaev, but said that typically medical workers making rounds each shift monitor the inmates. He said guards also keep an eye on some cells with video cameras. Tsarnaev's mother said the bombing allegations against her son are lies. Meanwhile, Russian authorities secretly recorded a telephone conversation in 2011 in which one of the Boston bombing suspects had a conversation with his mother of a radical nature, officials confirmed to CBS News correspondent Bob Orr Saturday, days after the U.S. government finally received details about the call. In another conversation, the mother of now-dead bombing suspect Tamerlan Tsarnaev was recorded talking to someone in southern Russia who is under FBI investigation in an unrelated case, officials told The Associated Press. Two years later, authorities say Tamerlan and Dzhohkar detonated two homemade bombs near the finish line of the Boston Marathon, killing three and injuring more than 260. On Saturday, authorities ended their two-day search of a landfill 60 miles south of Boston, near where Dzokhar attended college. Sources say investigators were looking for laptop computers as they try to determine what shaped the Tsarnaev brothers' views, CBS News correspondent Elaine Quijano reports from Boston.